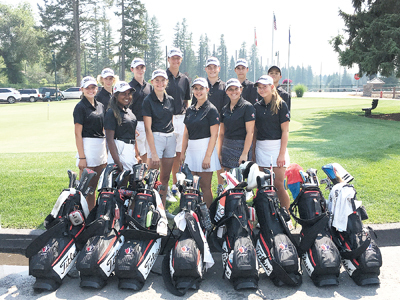 It was all in the family for a Taber duo who competed at the 27th annual Alberta/Montana Junior Ryder Cup earlier this month at the Whitefish Lake Golf Club. “It’s based on your rankings and your finish at provincials, plus coaches selections,” said Andrew Makarchuk, who competed recently in the tournament alongside his sister Alanna as members of Team Alberta. The tournament ran two days with three rounds of golf with three different formats of match play. The first round was Four Ball, the second round was Chapman and the third was individual match play. Andrew won his Four-Ball match, but lost his Chapman and singles matches. Alanna won both her Four Ball and Chapman matches. Andrew noted his short irons game was strong during the tournament, but he was unable to continue that momentum once he reached the green. “I hit my wedges really well, getting it to 12 to 15 feet no problem. But I was struggling to make my putts where the birdies weren’t falling. I was making easy pars, but pars weren’t doing it,” said Andrew. “There were a few times I was able to make some clutch putts to win a hole or halve the hole,” added Alanna. Andrew enjoyed the Ryder Cup format where normally the individual game of golf had the team aspect to it for two thirds of the rounds, where increased strategy was involved. The Ryder Cup has proved to be a solid exclamation point to a productive golf season so far for both Andrew and Alanna. Andrew Makarchuk will soon be making his way to Minot State in North Dakota to play for the golf team there. The college golf season goes from late October with five tournaments in the fall, with the spring slate still to be determined. Andrew earned a second-place finish in Calgary and missed the cut off at nationals by a couple of strokes. Alanna Makarchuk has competed in a bunch of tournaments, including one in Jasper this past weekend, which included competitors from Australia. Alanna took a third in Banff, and a fourth at Paradise Canyon in Lethbridge. She also earned 12th at provincials.